New Delhi: Good news for the Panamera lovers as the next generation of a one-of-a-kind luxury saloon from the German powerhouse is set to be launched soon on June 28, 2016. Porsche has disclosed a new teaser image and an introductory video ahead of its unveiling. The same will also be a part of Porsche’s line-up at the Paris Motor Show later this year. Although, several spied pictures have already surfaced online which indicate some significant changes for the second generation model. The C-pillar underwent a significant change, as it now has been contoured with a sharp and an aggressive rear. In tune with that, it will also manifest a stretched bonnet and a lowered roofline. This will help the saloon to achieve a sportier stance rather than an ‘estate’ like demeanour. Its connected LED strip at the back seems to be inspired from the current 911 series, while the front-end might also witness a new four-point LED design borrowed again from the 911 sportscar. Riding geometry will also improve as the next-gen model is set to use the Volkswagen Group’s new multi-material MSB platform which will help this bulky saloon shed at least 90kg compared to the current model. Refusing to deploy naturally aspirated engines, we firmly believe that a new set of V6 and V8 turbocharged motors will also be introduced on the Panamera and a hybrid version will soon follow. 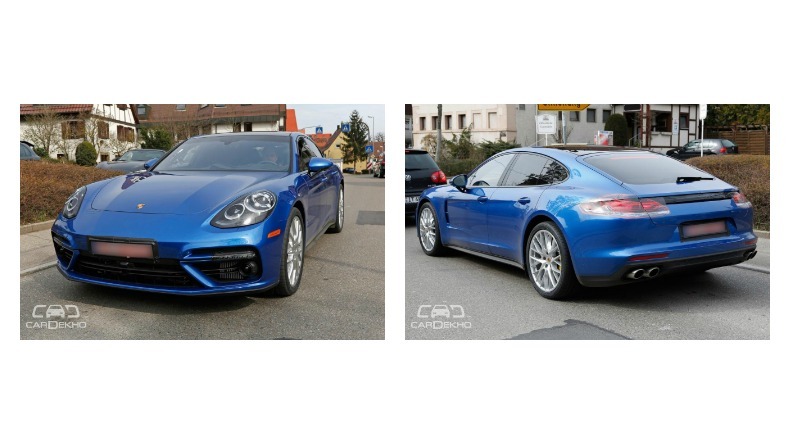 Keep reading this space to know more about the Panamera.